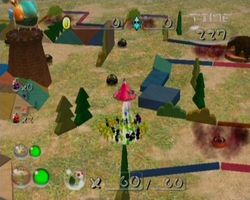 Three Color Training is the seventeenth level in Pikmin 2's Challenge Mode. There are gas pipes, Anode Beetles, and one Gatling Groink atop a tower. The Gatling Groink has The Key, and it is at the top of a tower. You should try to place one of your leaders as close to the tower as possible; the Gatling Groink will try to fire at that leader, but the shot will be stopped by the tower. There are a few wooden blocks on one side of the tower that you can use to throw your Yellow Pikmin onto the platform of the Gatling Groink. Take caution when calling your Pikmin back; if you whistle for too long, the leader you left as bait will come back to your side, which will waste time. After defeating the Groink, collect The Key it drops (and the corpse, if you want to collect the other treasures), and either collect more treasures or just escape. If you are just going for the pink flower, use this strategy: send one leader without any Pikmin to the Gatling Groink and find a spot where it can fire at you without hitting you. Now, take the other leader with all the Yellow Pikmin and attack the Gatling Groink until it dies. Now, quickly carry back the Gatling Groink (before it comes back to life) and the Key. Hopefully the exit will appear somewhere easy. This page was last edited on April 11, 2018, at 23:29.